I love Lauren Thompson’s Mouse series. They’re the perfect size for my 2s. I pretty much made the entire series in flannel stories so the children can match up what Mouse finds on each spread. 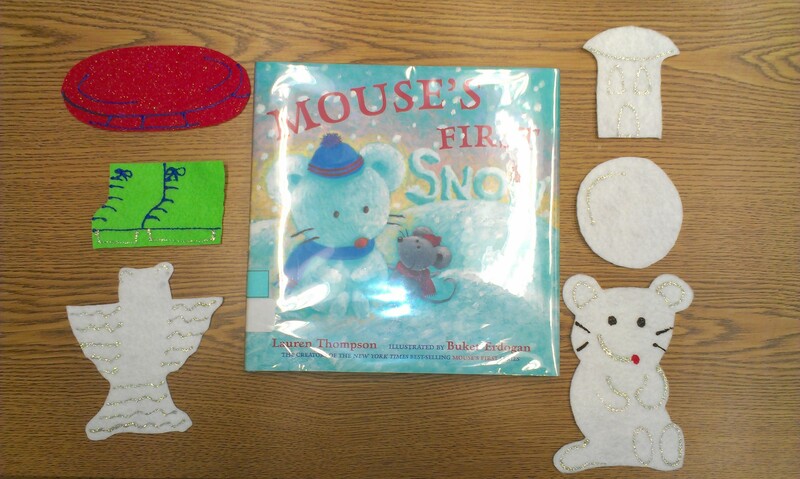 This story, Mouse’s First Snow, features: a sled, skates, snow angel, snow house, snow ball, and snow mouse. I used glitter puffy paints so they sparkle! Next week is supposed to be our first snowfall in the northwest hills of Connecticut, so I’ll be breaking this one out! Here’s a craft for Snow Mouse. I plan on using glitter paints for this! For more flannel ideas, check out What is Bridget Reading? She’s hosting Flannel Friday this week! Can you tell me how you use the flannel pieces with Mouse’s First Snow? Do you have the book in your lap and use a mouse puppet? Would you mind doing a video some time (I know you have lots of spare time!) Thanks for your wonderful blog! Yes, I’ll add this to my video list and let you know when I post it. I read the book and have the mouse puppet in my hand. (Sometimes I throw a hat/scarf on him.) I pass out the flannel pieces to the children before I read the story and when they see mouse doing it, they come up and bring their piece. I like to use my lap flannel, but you could use an easel one if you prefer. I just finished watching — this really helps! Appreciate it so much. Happy Storytiming! This entry was posted on November 22, 2013 by mrsshaia in Flannel Friday, Flannel Stories, Video Clips, Winter Stories and tagged Flannel Friday, Flannel Stories, Video clips, Winter Stories.